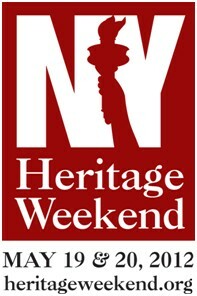 The 2012 New York Heritage Weekend is almost here! On May 19 th and 20th, more than 180 events will be held from New York City, north to the Canadian border, to Buffalo and all points near and far. Heritage Weekend features special programs, lectures, tours, re-enactments, and discounted admission at heritage and cultural destinations throughout New York State. Heritage Weekend celebrates national, state and local heritage. Historic sites, museums, architecturally significant buildings, battlefields, and historic districts are just some of the venues where you can expect to find Heritage Weekend events. Heritage Weekend showcases the diverse heritage of New York State including: military history, arts and culture, historic waterways, innovation, architecture, freedom and dignity, traditions and cultures, and community heritage. With more than 180 events being offered this year, there is something for everyone! To find events near you visit www.HeritageWeekend.org. Last chance to take a walk on the whimsical side and see imaginative creations from artists. improv completely controlled by you. Walking historical tour, historical treasure hunt for the kids, story time, and concert in the Gazebo from 1pm till 5. Docents will be giving free admittance and tours of the Seneca Museum and Visitor Center all day. New York Heritage Weekend is presented by the Hudson River Valley National Heritage Area, in partnership with Erie Canalway National Heritage Corridor , NYS Office of Parks, Recreation and Historic Preservation, the National Park Service, I Love New York and sponsored by more than 150 organizations hosting Heritage Weekend events throughout New York State. 0 Comments to "NY Heritage Weekend, May 19 & 20"